We were very pleased to welcome 21 students to perform at our annual Soiree on Wednesday 13th March. The soiree aims to provide our students with an opportunity to perform their music in a friendly, informal environment. It was very encouraging to see how many family members, staff members and past students were present in the audience. The evening began with a performance by our performing arts teachers, Sarah Mildner and Elissa Gault on flute and piano. We then heard performances on violin, piano, guitar and voice by the children. The quality of each performance showed the dedication of our students and families to regular practice of their instruments. Our audience was incredibly supportive and encouraging of all the performers. 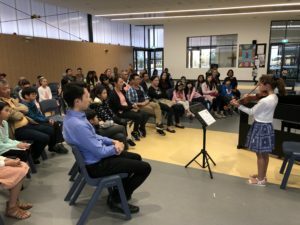 Even though many students admitted to nerves, it was clear that everyone present left with a great sense of pride in the achievements of our budding musicians.